WSJ.COM 11/20/13: Much of Japanese Prime Minister Shinzo Abe's economic revival strategy is still on the drawing board, but earlier this month he helped his cause by abandoning Tokyo's 2009 pledge to reduce the country's carbon emissions by 25% from 1990 levels by 2020. Mr. Abe's announcement came as world potentates meet in Warsaw for more talks on global carbon reductions. Tokyo isn't entirely giving up. But its new carbon target—a 3.8% cut from the 2005 level of emissions by 2020—amounts to allowing emissions 3% higher than the 1990 level. One reason for the shift is politics. The 2009 target was set by Democratic Party of Japan Prime Minister Yukio Hatoyama. Although Mr. Abe had supported carbon reductions during his first stint as prime minister in 2007, his Liberal Democratic Party, which traditionally enjoys strong industrial support, has little political capital invested in the DPJ's pledge. 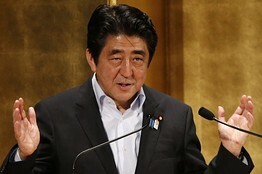 Mr. Abe has also promised to revive economic growth, a goal incompatible with strict emissions limits. Deep carbon cuts would require sharply higher energy costs—already high in Japan—via some combination of cap-and-trade, direct carbon taxation and subsidies for renewables. And while the Japanese public still generally favors some action on climate change, specific steps have grown less popular. When Mr. Hatoyama made his pledge, for example, nuclear generators produced roughly one-third of the country's electricity and that proportion was slated to increase in part as a way to reduce emissions. Since the 2011 Fukushima disaster, voters have turned against nuclear power as they conclude the costs of accident risks and clean-up expenses are much higher than they were led to believe. The country's reactors are all idled with uncertain prospects for a restart, so Japanese are burning fossil fuels instead. When Tokyo committed to big emissions cuts four years ago, Japan was also already one of the most energy-efficient economies in the world. The only ways for Japan to meet radical emissions targets were to invest heavily in new and still unproven technologies or to curtail economic activity. Much of Japan's carbon reductions in recent decades have been driven by underlying changes in the economy. Energy-intensive industries such as steel production have declined as a share of output relative to more efficient industries such as machinery manufacturing, and manufacturing is giving way to services as factories head overseas. But the pace of this adjustment has been slowing, according to Richard Katz of the Oriental Economist. Political controversies over the "hollowing out" of industry show Japanese voters aren't willing to abandon manufacturing. Despite the shock and horror professed by global climate mandarins, Japan is not going to become the Worst Polluter in the World as a result of this announcement. Instead, it will be a country that is striking a smarter balance between the uncertainty of global-warming predictions and current economic reality.